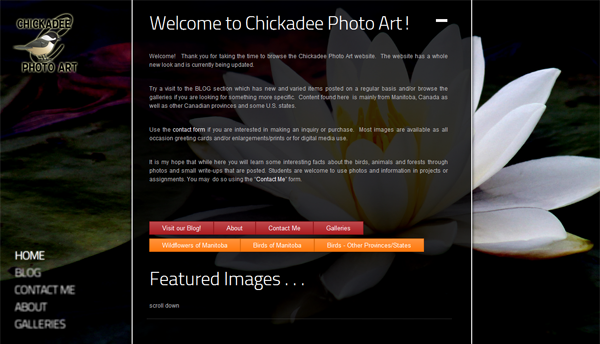 Chickadee Photo Art has been working with us since 2008 and showcases hundreds of beautiful wildlife and nature photos. Sharon of Chickadee Photo Art was looking for an outlet to share her amazing photography. She travels extensively around the Manitoba and Southern Ontario regions taking photos of nature at it’s finest and most natural. Over the years, we’ve updated her website a few times to stay up-to-date with a real focus on showcasing her work. Her work as become quite popular and she now offers many of here photos for sale in print form. After walking her through the admin area, she has become very proficient in updating her own site (something she does almost daily!). We now simply provide hosting and support with a bit of monthly maintenance mixed in. She knows she can contact us at any time for help and advice.